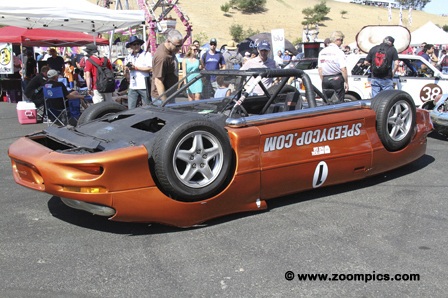 2014 Sonoma Raceway, California – The Upside Down Camaro race car is the brainchild of Police Officer Jeff Bloch. 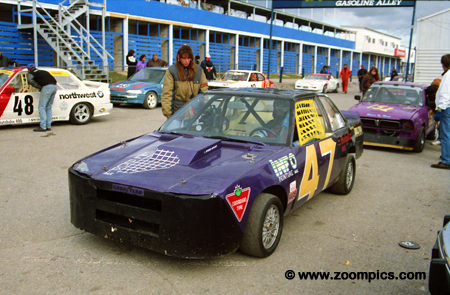 The project uses a 1999 Chevrolet Camaro body which is fitted on a 1990 Ford Festiva and competes in LeMons race events. The Camaro is just one of Bloch’s many creations – more can be seen at SPEEDYCOP.com. 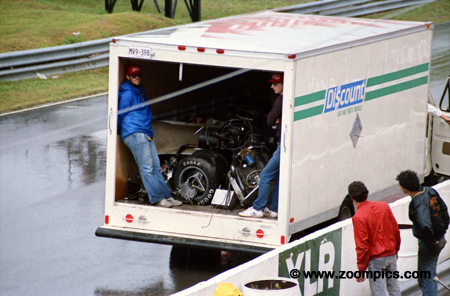 1993 Mosport, Ontario – Time for a quiz. What is it? This is based on a production vehicle but the fabricator has taken a few artistic liberties with the bodywork - like replacing the original doors, fenders, grill and quarter panels. 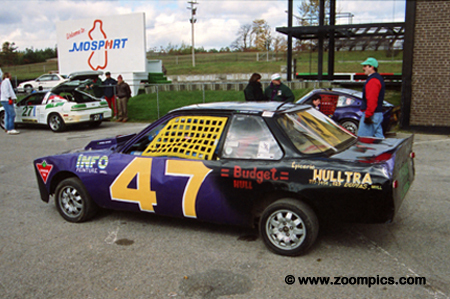 1993 Mosport, Ontario – Here is another view but even the taillights have been changed or upgraded – depending on your point of view. Give it some thought before you click here for the answer – it was quite a common make and model. 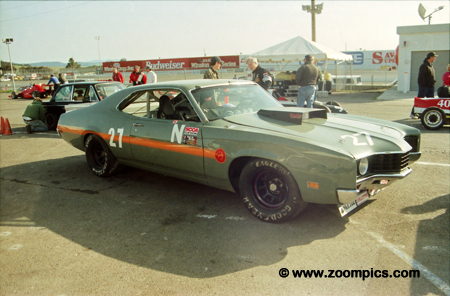 1999 Sears Point, California - This 1970/71 Mercury Cyclone was spotted at Sears Point during an SCCA Regional event. 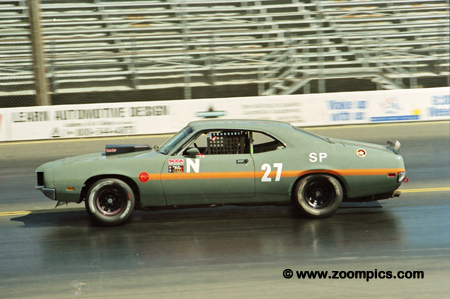 It appeared that the car was prepared to ‘70s race standards – a non-tube frame car. In 1970, Mercury offered three versions of the Cyclone – base model, Cyclone GT and Cyclone Spoiler. Depending on the package selected the car was fitted with 351 or 429-cubic inch engine. 1999 Sears Point, California - In 1999 this Cyclone was fitted with a 520-cubic inch motor. This was an exciting car to watch race as the driver, Matthew Robison, 'drove it like he stole it'. Since 1999, the Mercury has gone through a number of updates and has morphed into the very popular "Merc9" – worth doing an internet search. 1986 Mosport, Ontario – Have you heard the expression? – “A bad day at the race track is better than a good day at work.” Frank Chianelli might take exception to that statement. During lap-4 of the Can Am race, Chianelli had an accident which split his car in half and required two emergency trucks to return the vehicle to the paddock. 1986 Mosport, Ontario – He was driving a March 84C originally used in the Championship Auto Racing Teams (CART) series. It was common for teams to purchase these old Indy cars and convert them to compete in the Can Am series. No serious injuries were reported which could probably be attributed to the safety standards required by a car originally designed for the CART series. 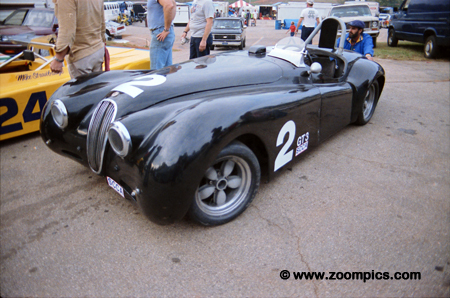 1984 Road Atlanta, Georgia – This is a Jaguar XK120M and it was not photographed at a vintage race event. The shot was taken at the Sports Car Club of America’s 1984 Runoffs. The Jaguar XK120M was produced from 1951 to 1954. At the ’84 Runoffs, it was in the GT3 class which included mostly current model year 2-liter sedans from manufacturers such as Nissan, Volkswagen, Mazda, Porsche and BMW. 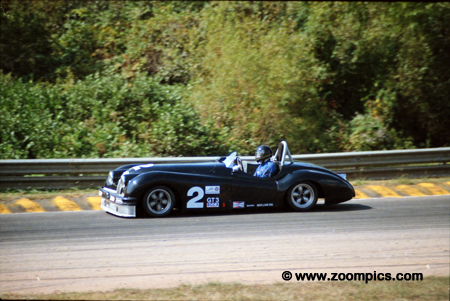 1984 Road Atlanta, Georgia – The original Jaguar was powered by a DOHC straight-six 3.4-liter engine which produced about 180-hp. This GT3 car had an engine built by West Coast sports car racing veteran Jon Norman. The motor the team planned on using at the Runoffs had 350-hp but it blew up on the dyno and was replaced with an engine that produced 300-hp. 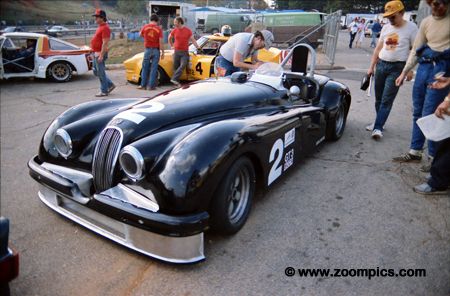 1984 Road Atlanta, Georgia – This Jaguar was capable of 160-mph down Road Atlanta’s back straight but with such a large engine it was required to weigh 2,800-lbs. Speed was not an issue but the same could not be said for braking. The Jaguar was driven by John Anderson the 1977 G Production National Champion. Anderson started fifteenth in a field of thirty-five starters. Unfortunately, the car retired after only 3-laps. 1993 Mosport, Ontario – Time for another quiz. What is it? If you find this one easy to identify it’s because you’re old. If it is not recognizable, do not be misled by the classic Eastern European body lines – this not a Trabant. Think about before you click here for the answer. 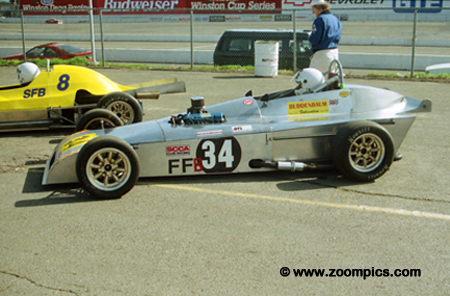 1999 Sears Point, California - How many front-engined Formula Fords can there be in the world? Well at least one. 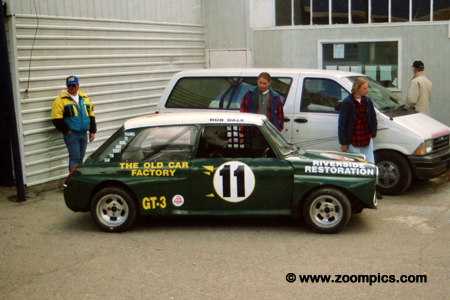 This is a 1994 Marlyn driven by John Buddenbaun. The car was fitted with beautifully crafted aluminum bodywork. And, it was competitive - running in the top half of the grid at Sports Car Club of America races. 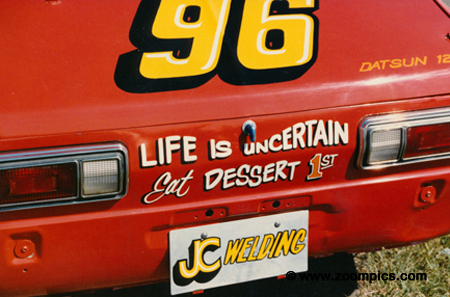 1986 Watkins Glen, New York – This message was spotted on the back of Al Firlein’s GT5 Datsun 1200. It appears that Mr. Firlein is sharing his philosophy on life. 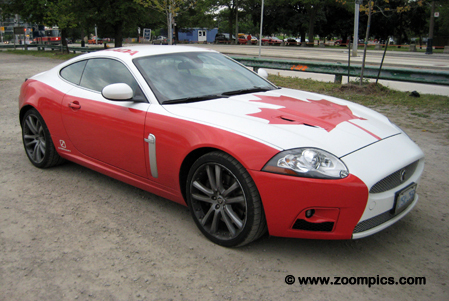 2010 Toronto, Ontario - I don’t imagine that this was a factory paint option for a 2008 XK series Jaguar. Perhaps, there is a patriotic graffiti artist in the owner’s neighborhood. It is also possible that someone simply lost a bet. 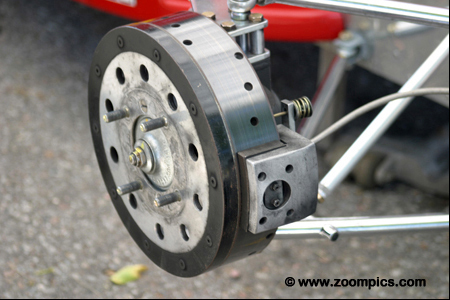 2007 Mosport, Ontario - This is a drisc brake fitted on a Formula 4 race car. An exercise in engineering that appears to utilize the benefits of both disc and drum brake technology. 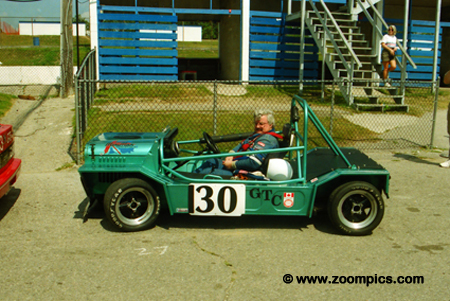 2012 Mosport Driver Development Track, Ontario - Everybody wants media credentials, however, at this very moment having the access of professional photographer may not seem like such a good idea. 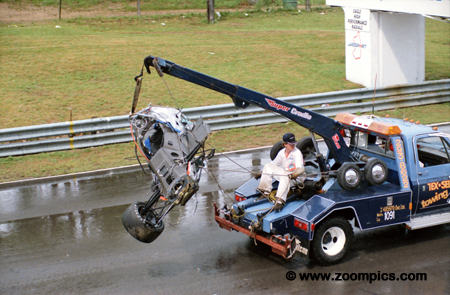 1996 Mosport, Ontario – Have you ever seen one of these? It is a Mini Moke. The Moke was produced by the British Motor Corporation (BMC) and shared much of its running gear with the original Mini. BMC intended to sell the Moke for military use but their poor ground clearance made them impractical. As a result, the vehicle was marketed to the public and proved to be very popular in England and Australia. 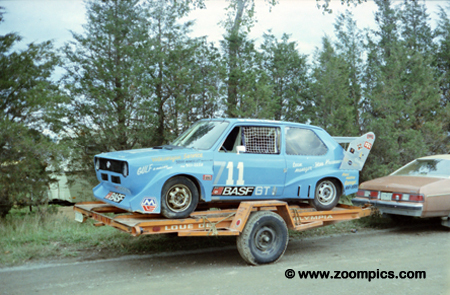 1979 Shannonville, Ontario – It is hard to believe that this front wheel drive Volkswagen Rabbit would require a rear wing. Maybe it is not intended to be functional and the owner wants to make a statement or just thinks it looks cool. 2013 Canadian Tire Motorsport Park, Ontario – During the Canadian Touring Car race on the Victoria Day Speedfest Weekend Bob Attrell tested the limits of his right rear wheel – it failed. 2013 Canadian Tire Motorsport Park, Ontario – Attrell started on the pole for the weekend’s second race. On lap-8, at the very fast corner-two the wheel broke on his Hyundai Genesis. 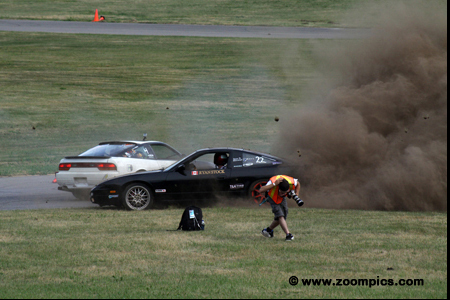 2013 Canadian Tire Motorsport Park, Ontario – The car sustained some damage but it could have been worse. Fortunately, when the broken wheel went under the Genesis it did not cause the car to roll. 2015 Las Vegas, Nevada – Time for another quiz. 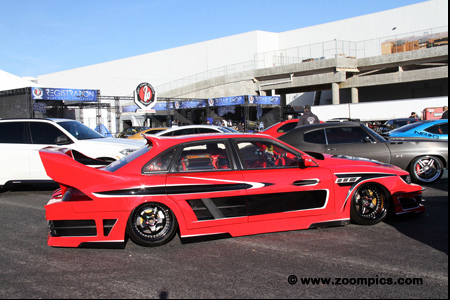 This vehicle was spotted at the Specialty Equipment Market Association (SEMA) show. If your local auto parts stores have run out of body filler, sandpaper, fiber-glass and resin the owner of this car probably lives in your neighbourhood. 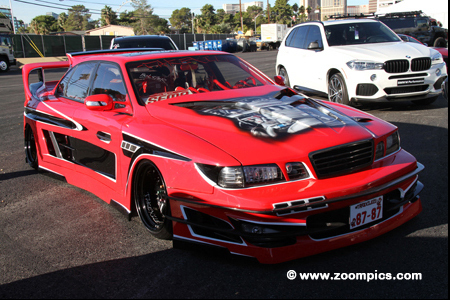 2015 Las Vegas, Nevada – Here is another perspective of the car - probably a better view. This one is difficult as most of the original body has been altered. Click here for the answer. 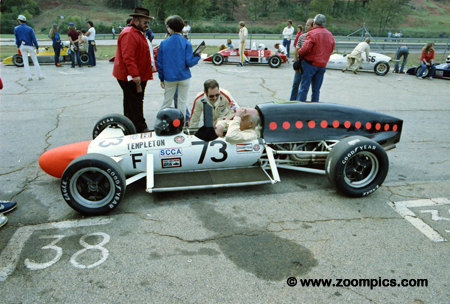 1982, Road Atlanta, Georgia – Harvey Templeton was well known for constructing very successful Formula Vees. After an eight-year absence from the Runoffs Templeton returned in a Formula Ford of his own design which was called HR7260. The HR7260 was named after the Bill that resulted in the American Social Security Act. The number on the car is Mr. Templeton’s age.